[DYNAMIC XJ] น้ำมันเครื่องคุณภาพสูง เหมาะสำหรับเครื่องยนต์ดีเซลงานหนักสมรรถนะสูง โดยเฉพาะรถดีเซลญี่ปุ่นที่ต้องการมาตรฐาน JASO DH-1 High performance monograde heavy-duty diesel engine oil. Designed for Japanese diesel engines required JASO DH-1 standard of both on-highway and off-highway applications. • Designed for high performance Japanese heavy-duty diesel engines required JASO DH-1 standard of commercial vehicles such as such as trucks, buses, trailers and heavy equipment. • Recommended all models of heavy-duty diesel engines required mono grade SAE 40. 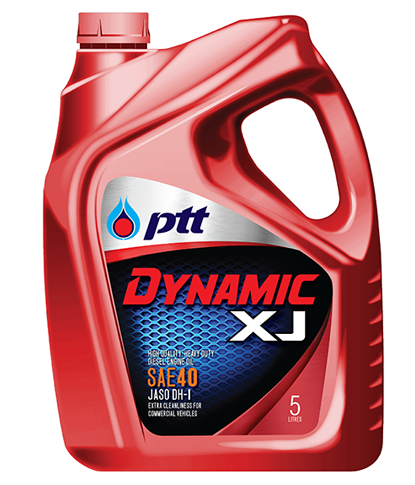 • Can be used for diesel engine pickup trucks that required mono grade SAE 40.